So, because Darcy's cagemate Scuttlebug died last week, I had to go find new meeces ASAP to start their quarantine and get them in with her. I searched five pet stores on Sunday and didn't find fancies OR the right sized cage. Luckily, I was able to go out yesterday and I came home with.. more than I thought I would. I went out to the same store I adopted Darcy and Daisy from, but they didn't have any mice out on the salesfloor. One of the employees went to check the back room and lo and behold: they had three mice. Because this is an all-female store, I decided to take all three. I haven't been able to finish this until now, and boy oh boy do we have a plot twist. 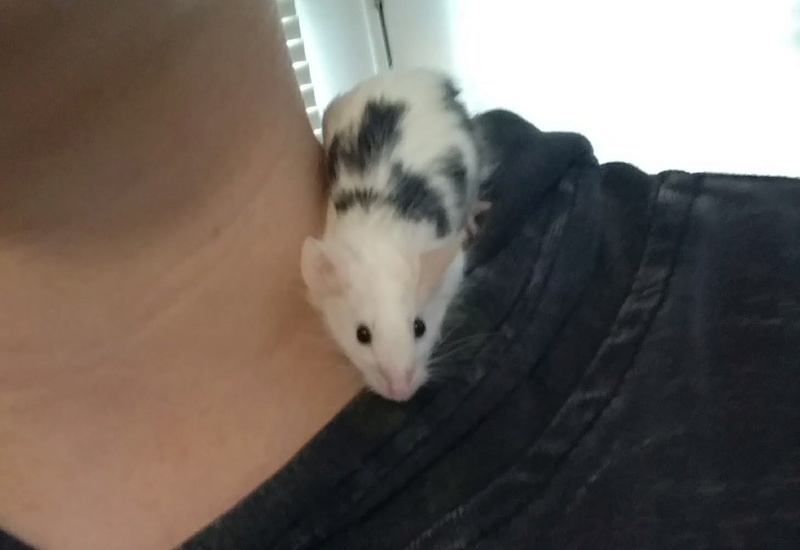 This is the first of the three to earn her name, little Daphne. We were considering naming Darcy Daphne originally, but obviously decided on the former. Now we've got the best of both worlds. "Daffy" has a long mousy face and shiny winter-white fur. She's the fastest of the three and also the most curious (and the bravest). The second to earn a name was Saratoga. She's bigger than the other two and a lot more tame. She's still afraid, but she'll be much easier to tame. 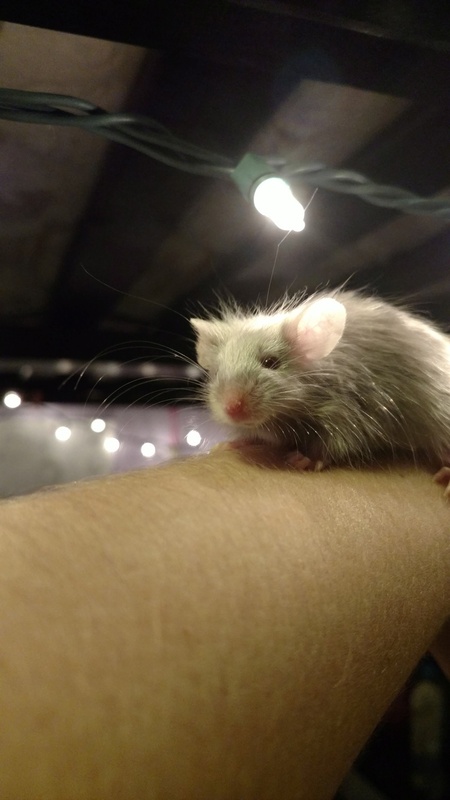 She's a light shiny grey with long fur that's already had mats in it. The third and final baby was Calypso.. Now Kalypso. Same name, just different spelling. 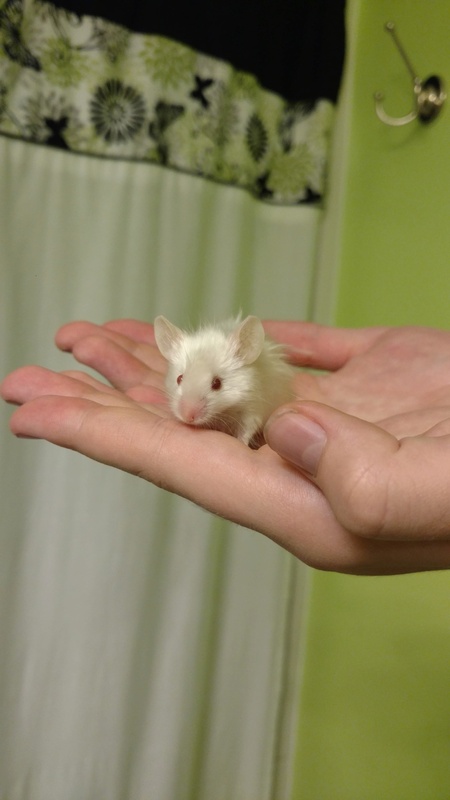 PetSmart's mouse supplier gave them a male. Honestly, it's half my fault for not checking when I adopted them, but they were scared and I didn't want to traumatize them.. I guess that's something I should do from now on. He's the same size and color as Daphne, but he's got a rounder face (and some other distinct differences...). So I'm not looking forward to keeping him separate. I can't just return him or swap him for another female. I saved him from whatever could have happened, he's already been scared enough. I have the cage space (I'll actually have two 10s and a 20), so I can't turn him away. I wish he didn't have to be alone, but I don't want babies or fights to the death. I also don't trust anyone I don't know to take him, so I'm kind of stuck either way. Congrats on getting them! I really love the look of the longer looking fur on Daffy. I hate when pet stores muck up and tell you the wrong gender. I've had that happen to me so many times over the years. Darcy is lovely! And little Daffy is just adorableness. The others are pretty cute, too... Saratoga looks like she might resemble my Mika. Your little boy will be just fine with lots of love and attention from you. @CallaLily wrote: So, so cute! They are all soooooo adorable!!! 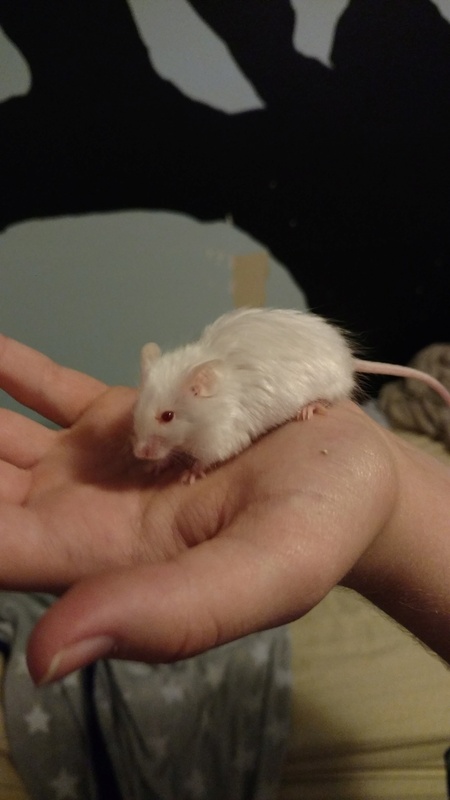 I have a male mouse, and he does fine alone.